Corn field landing To the best of my recollection of the facts, the events leading up to the ending of my flight in a corn field began with our flight from Chicago’s Waukegan Airport (UGN) to the St’ Louis area on July 4, 2013 for a family reunion. We landed with about 18 gallons of fuel remaining. That would be just barely enough to get home, about 2-1/2 hours depending upon the wind. During the reunion one of our nephews indicated that he had a 6 gallon fuel can we could use to add auto fuel to our tanks for the trip home so on the 6th,a Saturday, my professional pilot son and I picked up gas at a local gas station to fuel the plane. The can looked to be old so in order to prevent any contamination from getting into the tank my son used a coffee filter over the end of the filler tube as he poured the fuel in the tank. I noticed that he had a little trouble keeping the filter in position as he manhandled the 36 lb. gas can on top of the wing. The next day, at about 9am, we prepared to fly home. The reunion had gone very well with extremely mild temperatures and humidity for that time of the year in St. Louis. As a part of the preflight I drained about three times as much fuel than I normally do just to see if any contamination had gotten through to the sump, an indication that I was concerned a little about the fuel we had added. As we departed the St. Louis area we picked up flight watch who cleared us to climb and maintain 5500 feet, our planned cruising altitude. At that altitude the temperature was 65oF and the winds were 6 to 10 knots from 240o to 260o. At about 1:45 into the flight we were nearing the O’Hare Class B space. We had been cruising at 5300 RPMs so as I pitched the plane down I retarded the throttle slightly to keep the RPMs at 5300 as we descended at about 500 ft/min. The temperature was still 65oF. At 4700 feet the engine sputtered twice then stopped, the Dynon panel flashed “zero fuel pressure” and the engine light started flashing. I had just switched over to a Chicago Center frequency and notified the controller of our situation. We were out of gliding distance to Aurora (another 5 minutes we would have been right over the airport). I reported I could see the Aurora airport but had determined I couldn’t make it. He gave me a heading of 260o to try to make the Sandwich Airport, a private airport with a 3000 foot runway but it was South and West of the city which would have put me over the city itself at a very low altitude. The engine had quit just east of the city of Plano. I had trimmed for 70 kts. and once I determined I could not make Sandwich either I started looking for a place to land. We had been using ForeFlight on our iPad and I noticed a private grass 2600 foot strip to the NorthWest of our position so I changed from a 260 heading to one of 340. As we passed through 3000 feet I had tried restarting the engine 5 different times. The first two times I got just a short burst of power but nothing at each of the next tries. By the time I turned to GORD, the private strip, we were under 2000 feet (about 1000 feet AGL) and I could see we couldn’t make that either. My wife pointed out a country road just ahead but I could see trees hanging over the North sides of the road and power lines running along the South edge. By this time there was no other choice but to head for the cornfield that had stalks that looked like they were 6 to 7 feet high, better than the next field with what looked like low shrubs or crops of some kind. We hit the stalks nose high and tore up about no more than 30 feet of corn, caught something at the end and swerved hard to the right before coming to a stop. I shut everything down, checked my wife to see if she was ok and we climbed out her side of the plane. When she got out she looked up and there was a low wing single engine plane circling above us, obviously someone who had been alerted to our situation by Chicago Center. I called 911 and the operator said that they had already been alerted and that help was on the way, to stay with the plane. 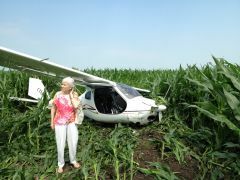 We were so far into the corn field that you could not see the plane from the road, but several minutes later we heard someone, who was being directed by the plane still circling above us, call out “I see the tail”. We were taken to the local hospital and cleared to go home. The plane was totaled. On refection, it is interesting that I never considered using the parachute or applying carb heat. In my 7000+ hrs. of flying, mostly in low wing fuel injected planes, I never had a parachute and obviously no carb heat. I had read that under the parachute you would be descending about 1,000 ft/min. When I looked at the panel just before landing it was varying between 150 ft/min and 300 ft/min. I will take that anytime. The CT has carb heat but during the 650 hours of flying the plane in all kinds of temperature and humidity conditions I never once used it and was told that it was not really needed, by people who were familiar with the plane and engine and should know. Plus, the minute the engine quit my mind told me it was fuel contamination and I never went beyond that conclusion. When the FAA and NTSB went to examine the plane three days later, they loaded it on to a flat bed and started the engine. It fired right up!!! They also checked all the fuel lines, screens, carb bowls, etc. and could find no contamination. Their official determination of the cause of the crash was, therefore, carb ice. According to Phil Lockwood, “if it had been carb ice, planes would be falling out of the sky every day”. According to Tom Gutmann of Airtime Aviation, the fact that the Dynon displayed “zero fuel pressure” indicated that it couldn’t have been carb ice. And the questions remained, could carb ice block both carbs at the same time and why the zero fuel pressure warning? So if we rule carb ice out, what could it have been? Is it possible that there was enough contamination to shut everything down and then dissolve/disappear in three days? A new thought turned up when a friend mentioned the possibility of vapor lock. His thought was that because of the fuel pressure of auto gas it should never be used at high altitude. Vapor lock would explain why the engine could not be restarted while it was still hot but would start after it cooled down. But 5500 feet is not that high and the failure started when I started to descend. I would be interested in hearing from anyone familiar with this plane who could come up with a reasonable explanation of what could have caused this engine failure. As a little bit more information, I did have all the hoses changed in the engine compartment according to the Rotax recommendations 22 flight hours before this happened. Otherwise there were no unusual happenings. Pictures of CTs after they experienced landing on anything other than a runway. Received the struts. Great service. What do I need to know to remove the old and install the new? Roger, left a message for you in the chat room. Both of my doors are sagging badly, have to hold them up to enter or leave the cockpit. Any ideas on how to get the doors to open all the way up to the underside of the wing? There are lots of CTs in Northern IL and Southern WI who could make a fly-in to Cedar Rapids or Iowa City. I use AOPA flight planner. Easy to use, good information, and it is free to AOPA members.